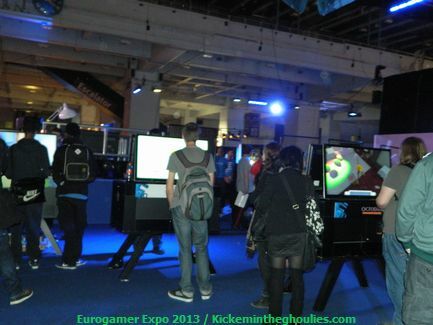 The Eurogamer Expo in London is the UK's premier video Games event ,and is held in the last week of September most of time, It here that many video games fans can get the first look at the forthcoming games and systems . Now games systems are only really released in five or six year cycles and the past two years we have been lucky to have had Nintendo's Wii U release last year and this year where even luckier that both new systems from Sony and Microsoft where being shown in the UK for the first time prior to their November launches. 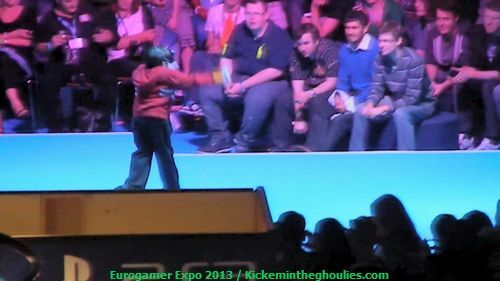 Now Eurogamer is a sell out event ,often selling out weeks before the show. 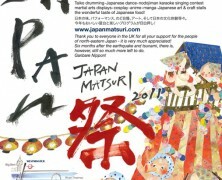 We where lucky to get press passes for the show due to our coverage of last years the show on site. Now with such expectations for the new consoles and all the shenanigans that have been going on between Sony and Microsoft especially with the DRM polices and Microsofts reversal ( but there is some interesting facts about that which we will discuss later on) we new it was going to be a good show. 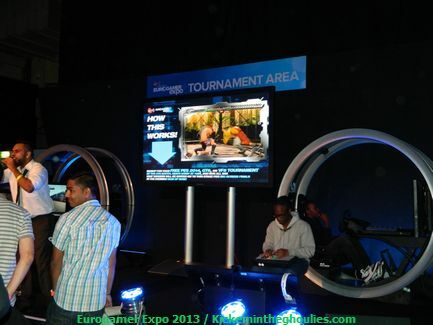 This year the expo was slightly bigger with some use of the upstairs of Earls Court for the over 18's area. 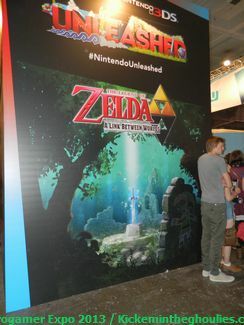 Once again Nintendo had secured a prime position near the entrance so that you had to walk past them on entry more or less. It is a important year for Nintendo with the Wii U system ,it may have had a good launch after last years show but it's software shortage due to Nintendo not realising the time needed to develop HD games took it's toll early in the year with new Wii U owners crying out for new content , it even loss exclusivity on one of it's key titles it showed at last years show ,Rayman Legends which was also delayed by 7 months. Lucky for Nintendo they had a good range of games to showcase the Wii U ,with new iterations in the Mario franchise ,Donkey Kong,Mario Kart and a HD remake of Legend of Zelda Wind Waker. 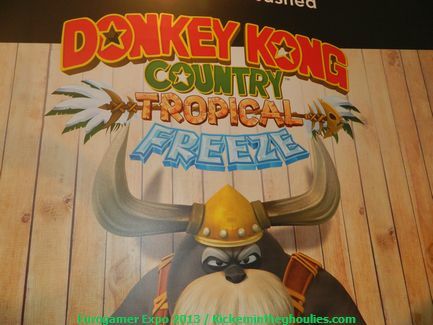 Donkey Kong Tropical Freeze is a really cool game ,but of course latest news is that now it's delayed till 2014 Spring. But Nintendo also had other big hitters like the exclusivity deal they had struck with SEGA which means the next three Sonic titles are only on Nintendo systems. 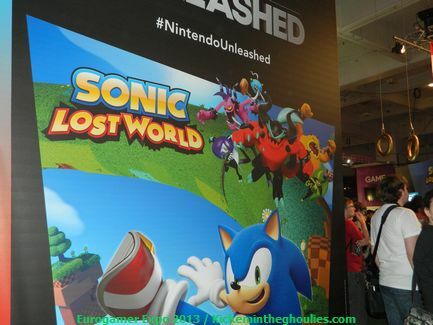 Sonic Lost Worlds is shaping up to be one of the best Sonic games for years and from impressions at the show from the playable demo I would say it could sell systems to the hardened Sonic fans that must play the latest Sonic title. Of course the title is also released on Nintendo's hand held 3DS . Another big hitter from the Platinum games studio who have entered into a deal with making two games for Nintendo as exclusives is Bayonetta 2 . 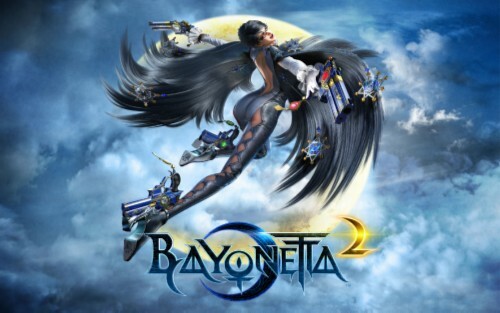 Previously Bayonetta was published by Sega on the Xbox 360 and PS3 . Though Bayonetta may have not sold bucket loads on those systems ,partly due to a poor port on PS3 and marketing strategies by SEGA for the games , Platinum admit that with out SEGA the game probably would have never been made along with others that where done by Platinum under a five game deal with Sega. So when Nintendo stepped up to publish and produce Bayonetta 2 exclusive for the Wii U it was deemed a good exclusive to have . Of course Platinum had another game for Wii U in production with Nintendo publishing which was shown at last years Wii U launch. 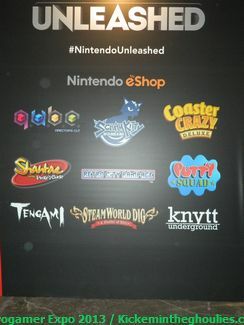 Nintendo also showed a showcase of Indie titles which could be the saving grace for Wii U due to the many developers applying to become Nintendo licensed developers . A task Nintendo is making easier by the minute. .There are more then thirty known Indie titles in development on Wii U at the moment and many of those will be hitting the console before Christmas. Indie titles on show where pop up book game Tengami , a adventuring 2d plat-former named Knytt Underground , Scram Kitty and his Buddy on Rails, A roller coaster game and QUBED. I will be taking a in-depth look at Wii U's Indie titles in a new feature soon. Not forgetting Nintendo's hand-held games of which the big game on the stand was Pokemon X & Y which releases on the 12th October 2013. 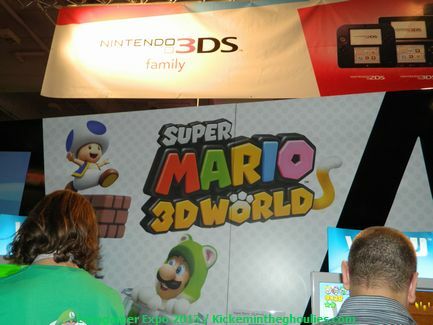 Nintendo's stand was colourful and bright and though some long queuing times was needed for some of the games ,namely Bayonetta 2 ,Mario Kart 8 ,Pokemon and Sonic . Most other titles where playable within a few minutes of waiting . Though I did wait for over a hour to play on Bayonetta 2 , but I must say it was worth the wait as it truly is a remarkable and lovely looking game. 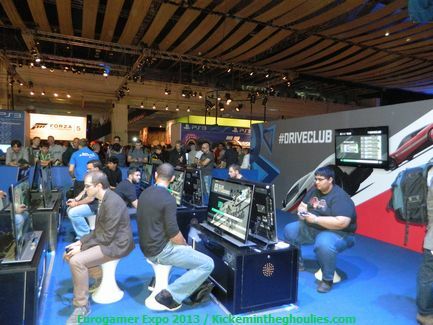 Now the big features of the show was of course PS4 and Xbox One. . Now Sony had a big central stand with all the PS4 consoles set up running Drive Club,Kill Zone,Assassins Creed IV Knack and Fifa 14 as the main big hitters. 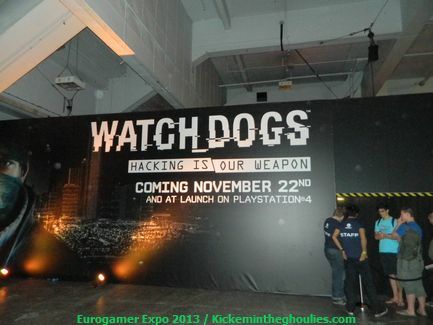 But they also showcased some Indie and Free to Play titles as well . 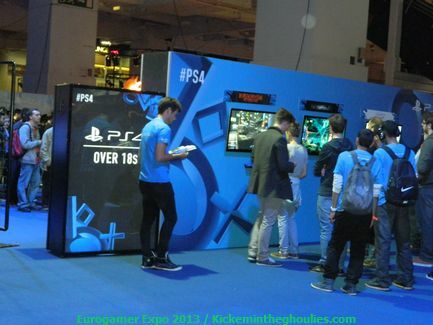 With a queuing system to rival a Mexican wave the wait to get on stand was around a hour and forty minutes , with some well placed PSVITAS along route you could play while you waited ,though a few more machines would have not gone a miss. 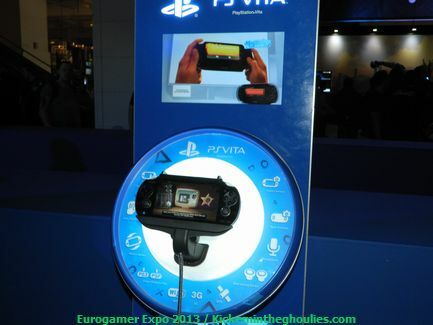 One of the many PSVITAS along the queue line, shame they did not have a few more. Now once you got to the front you where greeted by staff and handed a voucher to play the games, Basically you could play one game out of the big release section and one out of the Indie and Free to Play section. .
For Assassins Creed IV (AC4) and Killzone you had to join another queue as the games where 18 rated and they had to filter the boys from the men so to speak. AC4 I was not bothered by as Ubisoft had a whole stand on the upper floor showing the game , and the thought of waiting another forty minutes to play Killzone didn't appeal. 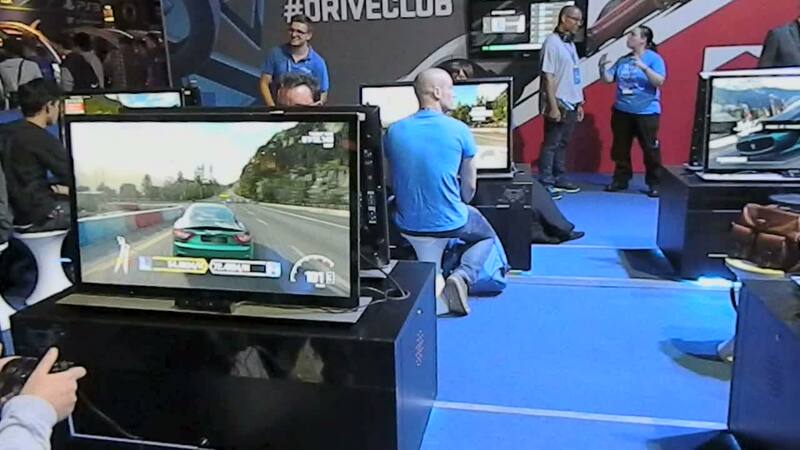 But one game I wanted to try was Drive Club. I got on quite quickly and actually got to grips with it after my first go , the new PS4 controller is very nice to hold with the shoulder buttons in a much nicer position ,quite weighty but not to heavy. 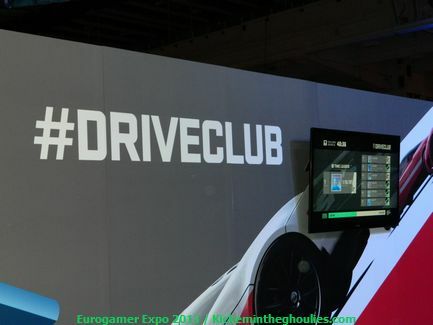 Drive Club boarders the line between Full simulation and arcade racer. Unlike your typical game of Forza or Gran Turismo it's not as hard to get into but then again it's no Project Gotham or Need for Speed. It requires you to understand the physics of the car but it allows you some leeway in the reality stakes. But that's not to say I didn't lose it on occasion . I must admit I spent about twenty minutes on Drive Club and my conclusion is it's a cool game and a game I would purchase and all I would need would be another couple of games to influence me to invest in a PS4 . 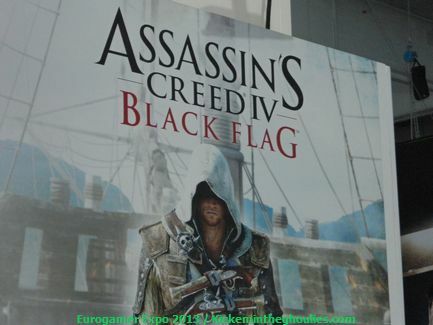 But to be honest the likes of FIFA are not gong to do that or even AC4 ,though it does look pretty awesome on PS4 . 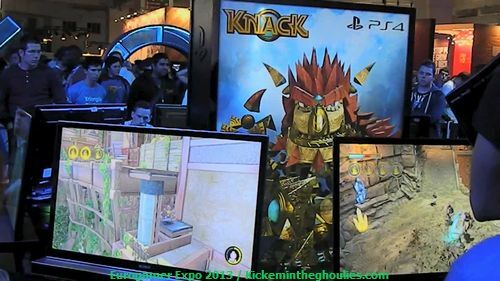 Knack was a unique game from what I saw . But it's probably not the system seller Sony may think it is. 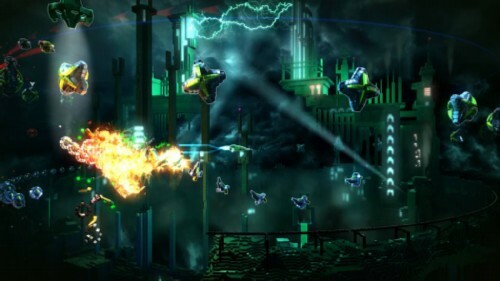 Now I did play a shooter called Resogun , it's a kind of traditional scrolling shooter in the shump mode. 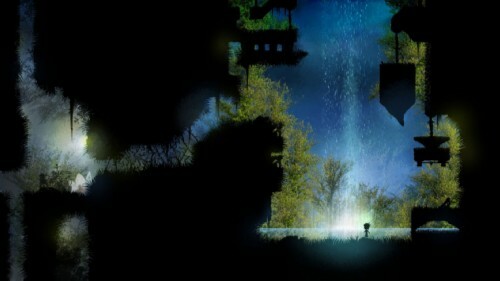 But it's the way it utilises some clever graphics and light effects that makes it stand out. But I would put it in the same vain as the Indie title on Wii U Nano Assault Neo. So I would expect it not to cost not much more then about £12. 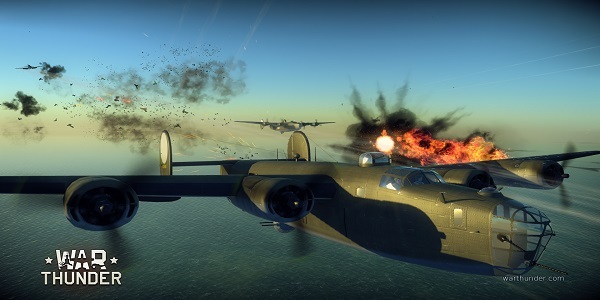 What was impressive was Combat fighter pilot game War Thunder ,it's a Free To Play online multiplayer game which is quite impressive in the graphics department , it's game play is easy to pick up and looks like it will have lots of depth. 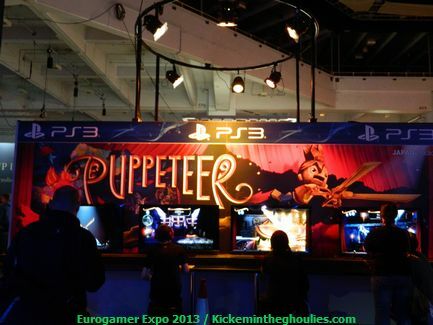 There wasn't a mass of PS4 titles and Sony could have squeezed in a few more machines to play on in the vast area they had. 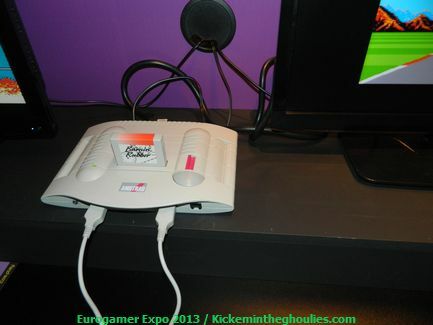 Now with all this waiting around time is a treasured thing , between spending time getting onto the Sony Stand and more or less waiting to play as much as possible on the Nintendo stand the hours passed by and I hadn't really seen half the show . 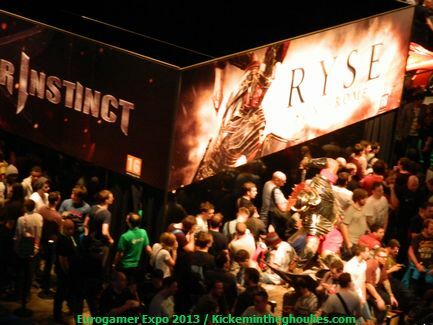 The Microsoft stand was split into sections with Microsoft choosing to have different queues for each of their games. 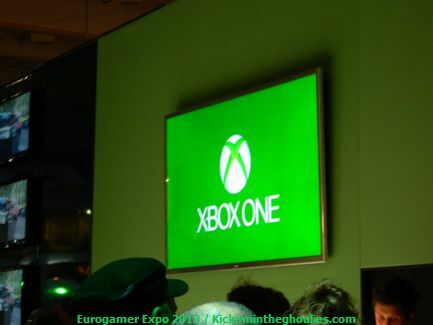 They also every hour on a dedicated stage held a mini conference showcasing something about XBOX ONE. . Forza 5 was the only Xbox One game which was visible to actually see on the show floor , all the others apart from Fifa 14 where behind a closed booth which you had to queue for and the queues where long and a bit disorganised. 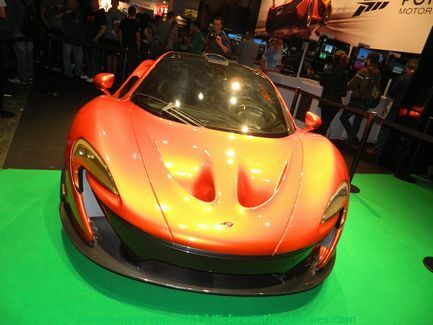 I chose not to queue for Forza 5 as I was never really a fan of the series ,finding it to much of a simulation for my liking . But it looked very crisp with some of the most realistic graphics you will see for along time. 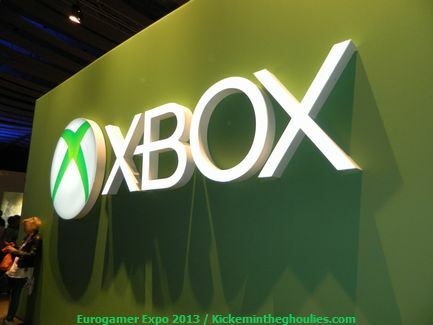 The Xbox One itself is quite huge very reminiscent of a old VHS player, it's not exactly pleasing to look at. Where as the PS4 is smaller and less a strain on the eyes .But neither console has styling to die for. 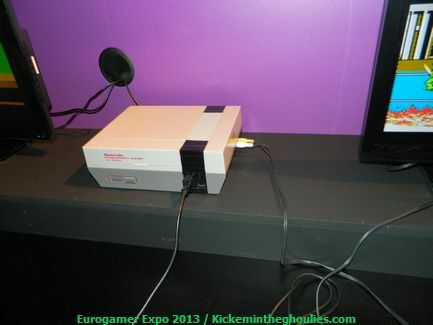 In fact if you take in to account Nintendo's Wii U ,which borrows heavily from it's predecessor all of the new consoles are quite boring in appearance. I actually miss the time when console manufacturers made unusual pieces of kit. I wander if where ever see the big boys design a great looking piece of kit in the future and maybe use some colours other then Black and White. Microsoft's consoles have always been big lumps ,but I actually liked the look of the original XBOX's and even purchased another when they where current just to get hold of the Crystal version which looks sublime. Even Sony's original fat PS3's had a unique and quite space age look to them and always remember seeing pictures of the limited editions they did in Japan in White ,Red and Blue.. Anyway I new I didn't have time to queue for outrageous times for the XBOX One and new I was back the next day so ventured of to look at other features of the show. 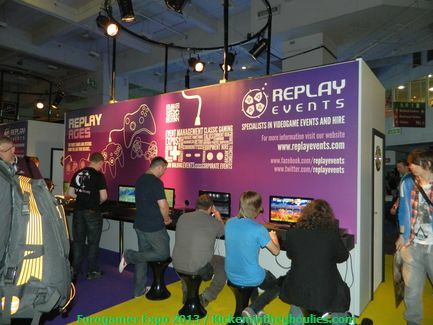 The Rezzed and Retro area was home to about every console from all the previous generations. 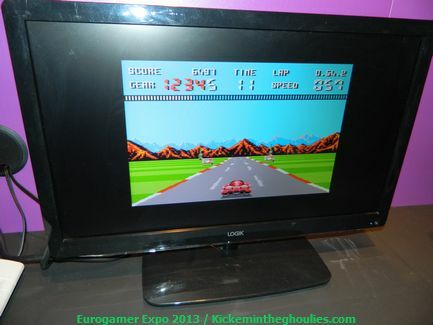 Run by the Play Expo team ( a show where visiting to) , it was great to see gamers enjoying playing still on these great machines from past iterations of the Playstaion's and Xbox to classic Nintendo and Sega systems including Megadrive and Dreamcast which still proves very popular. But they also had early 8bit computers and like the Amstrad CPC and Acorn Electron , and one of the 90's most cult gaming systems the Neo Geo in the original AES forms and the new Neo Geo X Gold hand-held and Base station which is such a unique looking piece of kit, which though receiving very mixed reviews actually looked quite good on the TV's they had them wired up to, better then I have previously seen . This could be to the recent firmware update improving video and other features for TV connection. 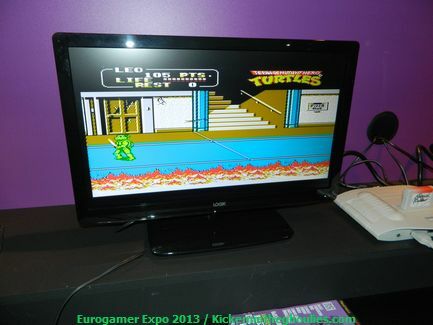 They even had a Vectrex console playable ,now that's a gaming ICON. 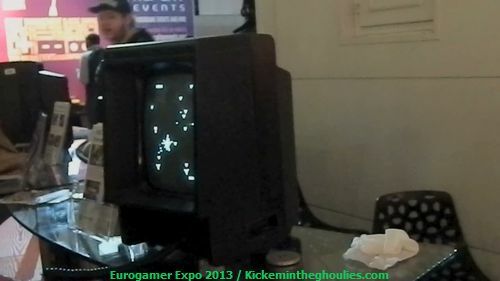 The Vectrex had it's own display, not quite portable though! 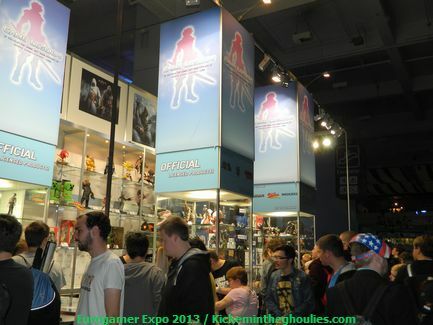 Upstairs was the 18 area ,hoping to see another plethora of games the area was quite small with only a fraction of the Gallery used to hose Watchdogs ,AC4 ,Battlefield 4 ,Wolfenstein New Order and Titan Fall and the new Ninja Gaiden game by Tecmo by the name of Yabia. AC4 looked stunning I must say and is probably a game I will delve into eventually. But it's not a day one purchase for me. 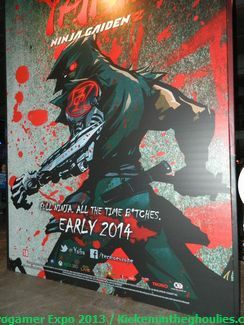 Yabia looked cool with it's cell shaded type of look and one to definitely watch out for in 2014. Again Watchdogs was behind a closed unit and queues upstairs where building. 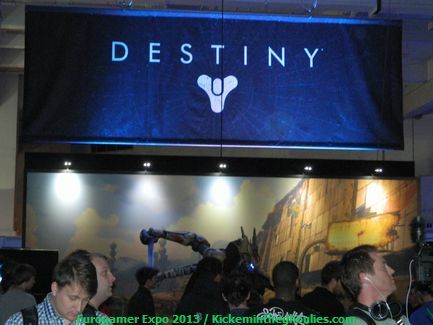 ,but the longest queue was for Titanfall which seemed to go on for ever. I felt the upstairs could have been used better with more sellers and more machines for people to get on. Compared to last years show the queuing seemed slightly mental ,OK I new there would be long waits but it just seemed the whole show was one long queue at one point. 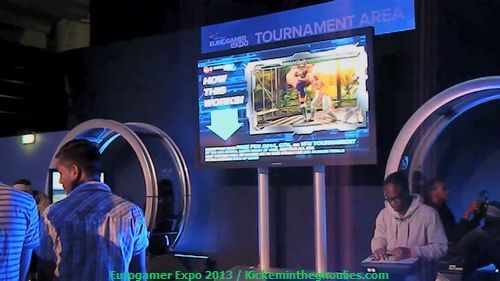 There where other facets to the show with the competition zone where contestants can compete in gaming Challenges to win prizes ,with Virtua Fighter Final showdown and Fifa 14 playing host to two of them. 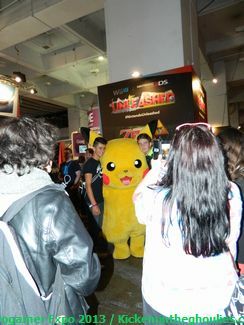 You also get quite a few cosplayers at Eurogamer now and they had a dedicated Cosplay stage for parades and Skit shows . This was situated downstairs and at one point the area around the stage was so busy it looked gridlocked ,they could have had this upstairs creating better movement downstairs and a better environment for the cosplayers to. 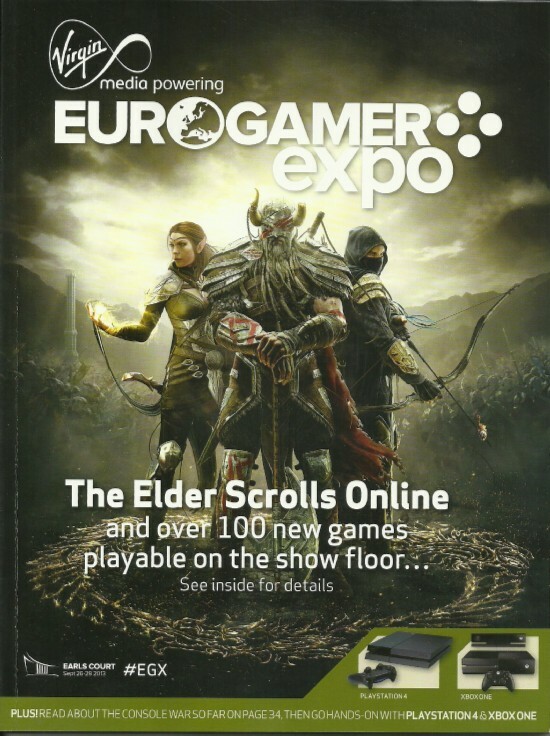 Thursday was a particular busy day as the show also plays host to the Industry Careers feature where budding gaming developers can meet publishers and developers in a hope to get that dream job in the industry. 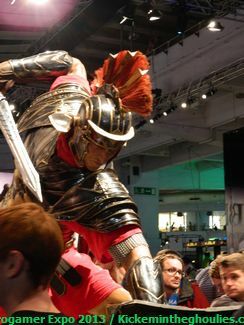 Also there where Conferences with developers and publishers where you could hear hands on about particular games and hardware. But with trying to see and play as many games as possible I chose not to indulge and I can watch them online anyway. Time was moving on and I had another engagement but I new I was back the next day to see what I could see. 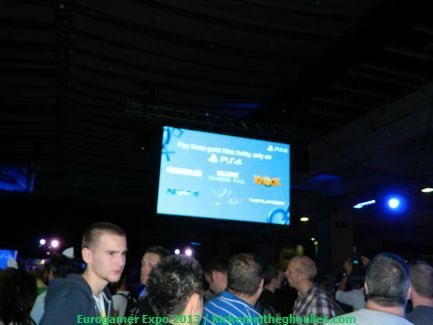 But all in all I enjoyed my Eurogamer Expo even with the waiting , I was happy to have gotten hands on with PS4 early on . I even managed to grab a bargain in the new Splinter Cell Blacklist on Wii U. 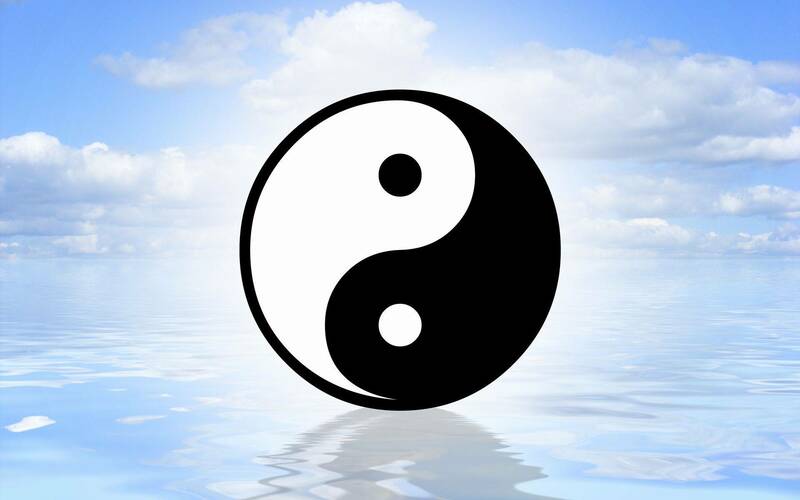 Which I must say is one tricky game ,but then I refuse to play it on easy. Review soon. I still think they could have more sellers ,it all seems all very limited to a set group of retailers. I like to choose what I buy from who from a range of sellers . Also with more sellers and features ,which could be housed upstairs it would create other avenues for visitors maybe making the queuing less of a chore. By reducing the length of those queues. 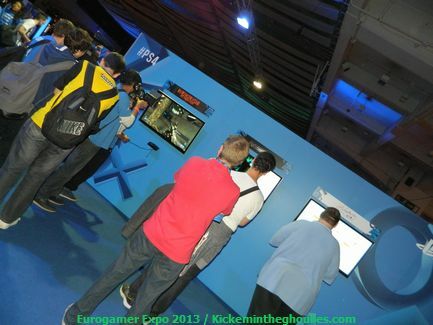 I thank Eurogamer Expo for the press passes and look forward to the show next year. By then all three of the new consoles will have a good catalogue of games competing for our money. Review Date : October 5th 2013.